The NCAA tournament is shockingly close to perfect because fairness is sacrificed so ruthlessly and deliberately at the altar of drama. In a playoff that exalted fairness above all else, Kentucky would have better than a 34 (Ken) or 41 (Nate) percent chance of winning it all. But this is the business we’ve chosen. It’s a single-elimination tournament with 68 teams. The inherent structure of the event means the answer to “Kentucky or the field?” is the field. The answer to “Incredibly Great Team X or the field?” is very nearly always going to be the field. The NCAA tournament is shockingly close to perfect because death is always just 40 minutes away, even for Kentucky. If we wanted to pick a “fair” or “real” champion we could shrink the field and kill the single-elimination format. But that’s the NBA’s shtick, isn’t it? If you want larger sample sizes and smoother win probability curves, the next level has you covered. At the next level it’s axiomatic that game seven always pulls in the best ratings. Well, the NCAA tournament is 67 game sevens. It’s been about 30 years since the tournament assumed its present form, and in that time we’ve come to a pretty good understanding of what the madness in March Madness really entails. Strictly speaking it’s not that “anything can happen,” because, well, anything can’t happen. If we keep playing long enough a No. 1 seed will eventually lose to a 16, but even when that happens you’ll still be looking at a win percentage for top seeds that’s 99.2 or higher. And on a purely rational basis the fact that No. 2 seeds win 94 percent of the time in the round of 64 should make us yawn. Instead we remember the ruptures in the hoops-space continuum torn with glee by the storied six percent: Florida Gulf Coast, Lehigh, Norfolk State, and other more ancient underdogs. Not one replaceable moment. Dull games happen, even in March Madness, but it’s this combination of certain death and potential transcendence in every game that defines the tournament. We recognize this quality as unique every time we watch actual NCAA tournament games, and we find this quality nowhere else in sports in quite the same manner and abundance. Which raises a question. Why do premortems for the sport pop up so asynchronously and portentously every March even though they’re always immediately refuted by events on the floor? Does the New York Times really think we’ll be “disappointed” by the actual NCAA tournament? As a genre the premortem tends to place a good deal of polemic weight on the premise that a fast pace and high scoring must be uniformly good. It’s not that simple. We didn’t gaze in wonder at USC and Auburn this season even though they played at a fast pace. Scoring plummeted in Big 12 play this season, and zero onlookers noticed or cared because the league was so strong. Scoring increased by a hair in ACC play and no one hailed a new golden age. There will be no visitors centers built or “30 for 30″s produced for the 2009 SEC — a lousy league blighted simultaneously with an aberrantly mediocre Florida and the Gillispie degringolade at UK — even though it was the highest scoring major conference of recent years. Some of my brightest colleagues really do think the sport is in crisis, and those colleagues tend to want a shorter shot clock. On the other hand many of my other bright colleagues don’t think the sport is in crisis, and many of them don’t favor a shorter shot clock. Then there’s me, and, as usual, I’m weird. This avowed crisis skeptic favors a shorter shot clock for two non-crisis-related and rather quotidian reasons. Speaking normatively there’s nothing optimal or Platonic about 35. And speaking comparatively a 30-second clock would make our current “15” the new “10,” the moment when even patient offenses know they have to be about the task. The one thing that everyone in this discussion can agree upon is that the number of timeouts has to be reduced post haste. Indeed it does this happy meliorist’s heart good to see this once heterodox notion now sweeping Twitter and winning writers’ polls in a landslide. My friend and colleague Jay Bilas is exactly right, the sport really is outrageously over-coached. However, it just so happens that it’s a jewel of an over-coached sport, one that culminates in an extraordinarily watchable postseason event. The problem with all annual up/down discussions — scoring, ratings, etc. The fact that the tournament will pull good ratings doesn’t prove that the sport’s in great shape, any more than good ratings prove that “The Voice” will live forever in the annals of classic television. Nevertheless, even a small year-to-year drop in ratings will be cited as evidence that the sport really is in crisis. This pass-fail set of blinders fails to capture the three characteristics of the tournament’s viewership that are most salient to advertisers. First, ratings for the tournament have climbed steadily now for a decade, and looking at the past 30 years slight one-year dips haven’t necessarily heralded true turning points. Merely at the level of the revenue model, crisis theories of college basketball lack a persuasive eschatology — what, exactly, will the End Times look like? — because, whatever your opinion of the on-court product may be, the NCAA tournament as a televised event has proven to be a spectacularly successful business proposition. I see ugly college basketball games on occasion because I see a large number of college basketball games. My colleagues see ugly games on occasion too, and it’s not too much to term this exposure an occupational hazard. For decades now, some of my colleagues have chosen to navigate this hazard by proclaiming the sport to be in crisis. And for better or worse many people who cover different sports proclaim the same thing. Baseball is said to be in crisis because of declining ratings and a generational drift away from playing the sport. Football is said to be in crisis because of concussions and retirements by 24-year-olds. Why are all of these crises continually becoming more dire by the second in all of these sports but never killing any of them? Purely in terms of human evolution, maybe it’s basically unnatural to be doing what my colleagues and I do for a living. Maybe the leap that’s been made in the last one or two generations from actual productive labor to this is just too much of a shock to the limbic system, and crisis talk is the hush money our conscience requires for being paid to talk about people putting a ball through a hoop. (Or paid to talk about people carrying a ball across a painted line, or paid to talk about people hitting a ball with a piece of wood — basically anything with people and a ball.) Maybe crisis talk adds a whiff of gravitas to an otherwise ephemeral endeavor. If space aliens land tomorrow and weed out all the non-essential employees, I know I’m in trouble. I accept that, but I still love watching college basketball at its best. 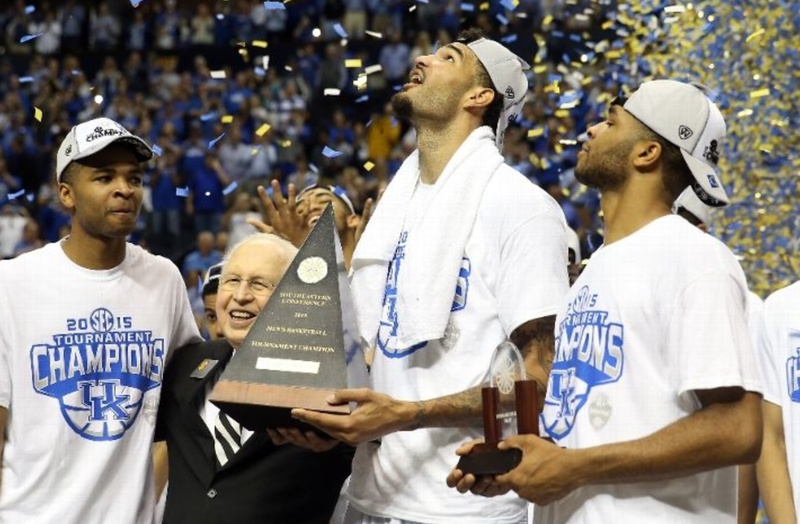 And I still feel today is the best day of the year, because the NCAA tournament presents drama, magnitude, and finality like no other event in sports. This entry was posted in hoops, in many ways the work of a critic is easy on March 19, 2015 by johngasaway.